Posted Dec. 18, 2014, 12:14 p.m.
Posted May 31, 2011, 9:30 a.m.
Joshua Montes, a 1-year-old Latino, was shot and killed Monday, May 23, in the 1200 block of East 55th Street in Central-Alameda, according to Los Angeles County coroner's records. 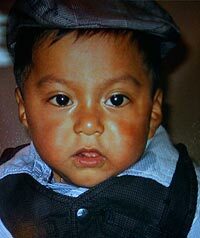 Joshua was shot on the porch of a home while being held by his uncle about 8:30 p.m., LAPD officials said. Both the toddler and the uncle, Josafat Canchola, a 46-year-old Latino, were struck in the head by a bullet. Paramedics took them to a hospital, where Joshua died. His uncle was listed in critical condition before dying from his injuries two days later. Police said that they believed the pair were probably unintended victims, but an investigation was ongoing. Since the incident, the Los Angeles City Council issued a $75,000 reward for information leading to the arrest of the person or people responsible for the fatal shooting. Councilwoman Jan Perry said she hoped the reward would help police find whoever is responsible for this "unimaginable crime." "These people obviously have no regard for human life, and we need to do everything in our power to find them before they hurt someone else," she said. Anyone with information related to the shooting is asked to contact Newton Area detectives at (323) 846-6556. Those wishing to remain anonymous can call Crime Stoppers at (800) 222-8477. It seems if theres more crime going on as the years pass by...I have to get out the hood ....On the real though! — Manny Feb. 9, 2012 at 5:42 a.m.
We are not suppose to judge,but these two should be sentneced to life with out the possibilty of parole. To take a life and not even have a care in the world. Just shows what kind of people we live around. My condolences goes out to the family,may god bless you. — lashawn Dec. 4, 2011 at 4:14 p.m.
— eva lopez June 22, 2011 at 9:55 a.m.
May God bless this young child and his uncle. What a sad,sad story. — Raymond June 8, 2011 at 7:33 p.m.